See scan - perfect mint condition with original patina. 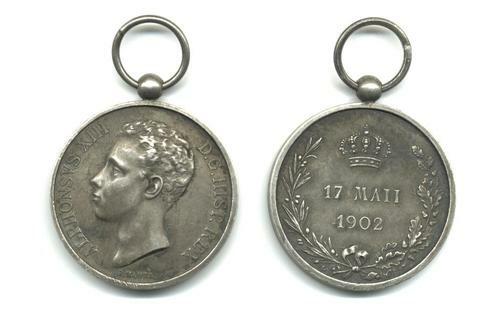 This is a rare Spanish Royal sterling silver 2nd Class of the May 17th 1902 Alphonse XIII medal. Obverse shows the young portrait bust of the Spanish monarch / Royalty with surrounding text in Latin (ALPHONSUS) ALPHONSVS XIII D.G.HISP.REX and reverse is the date surrounded by a wreath. The medal has a diameter of 30mm. Nice and rare militaria / military collector piece and one of the nice Spanish medals.